One of the greatest works of world literature, Dante Alighieri’s The Divine Comedy has, despite its enormous popularity and importance, often stymied readers with its multitudinous characters, references, and themes. But until now, students of the Inferno have lacked a suitable resource to guide their reading. 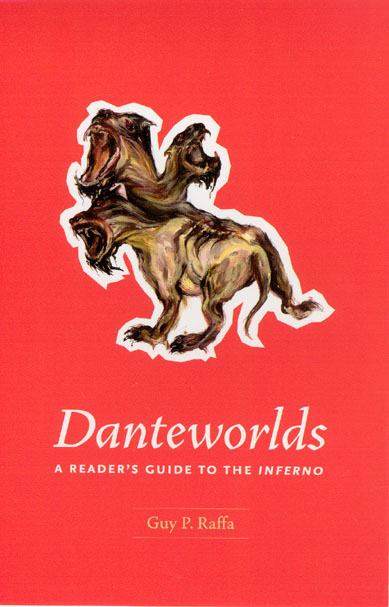 Welcome to Danteworlds, the first substantial guide to the Inferno in English. Guy P. Raffa takes readers on a geographic journey through Dante’s underworld circle by circle—from the Dark Wood down to the ninth circle of Hell—in much the same way Dante and Virgil proceed in their infernal descent. Each chapter—or “region”—of the book begins with a summary of the action, followed by detailed entries, significant verses, and useful study questions. The entries, based on a close examination of the poet’s biblical, classical, and medieval sources, help locate the characters and creatures Dante encounters and assist in decoding the poem’s vast array of references to religion, philosophy, history, politics, and other works of literature. Written by an established Dante scholar and tested in the fire of extensive classroom experience, Danteworlds will be heralded by readers at all levels of expertise, from students and general readers to teachers and scholars. poetic, and theological material that he condenses down to a manageable size for beginning readers is impressive and, as far as this reviewer could determine, largely accurate. . . . [Danteworlds] is written as a guide, explicitly working with the experience of the first-time reader in mind so that it succeeds in providing enough information for the first time reader to make sense of Dante’s poem without either providing one, ’definitive’ interpretation or taking the reader away from the poem to be lost in commentary and scholarship. Throughout, Raffa finds ways to provide context and clues that encourage the reader to return to Dante’s poem for a fresh look. The book, therefore, is not only useful for first-time readers, but also for those who regularly teach the Comedy to such readers. I, for one, have made a number of notes concerning new approaches to take and new questions to ask the next time I teach the Inferno in a general education course, and I anticipate recommending this guide both to students in that course looking for further help and to friends outside of the academy who are determined to read for themselves one of world literature’s greatest poems." "[Raffa] writes with modesty and common sense and gauges well the issues that need explication. His guide will be useful to teachers who have not been trained as dantisti as well as to students of the poem. . . . As an introduction, [the book] does a remarkable job of conveying a great deal of information as well as a lively sense of the richness, interest, and relevance of the Inferno."